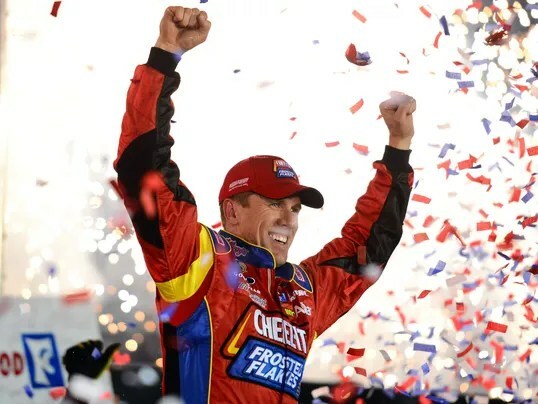 Carl Edwards was surprised to become a championship contender on a night when Bristol Motor Speedway felled many of NASCAR’s biggest stars in a race full of attrition. Edwards won Sunday’s Food City 500, putting himself in strong position to make the Chase for the Sprint Cup with his first win at the 0.533-mile oval in almost six years. Roush Fenway Racing teammate Ricky Stenhouse Jr. was second, and Aric Almirola took third to make it a top-three sweep for Fords. The finishes were Sprint Cup career bests for both Stenhouse and Almirola. Tony Stewart scored a season-best fourth, followed by Marcos Ambrose — Almirola’s Richard Petty Motorsports teammate. “It’s not a win, I know that, but it feels like a win,” said Stewart, who hadn’t finished higher than 16th in the first three races of 2014. Denny Hamlin, Jeff Gordon, Kasey Kahne, Brian Vickers and Kyle Larson rounded out the top 10. Edwards won his 22nd career victory under yellow on lap 503 because of a downpour that began shortly after the caution waved on lap 499 of 500. NASCAR vice president of competition Robin Pemberton said it appeared someone had leaned on an override switch in the flagstand that illuminated the track’s caution lights. The flagman then waved the yellow flag 6 seconds later, and NASCAR froze the field. The rain began a few minutes later on lap 500, and the race was called on lap 503 instead of holding a green-white-checkered finish, which Edwards was bracing himself to face. The muted ending was the last bizarre episode of a wild race in which several leaders’ shots at a victory went up in smoke — many of them literally. Kyle Busch, Kurt Busch, Kevin Harvick, Jimmie Johnson, Joey Logano, Matt Kenseth, Brad Keselowski and Jamie McMurray all finished outside the top 10 after leading laps with strong cars that were neutralized by mechanical woes, tire problems and crashes. The last big twist occurred with 50 laps remaining after Harvick slapped the wall with a mechanical problem. The front of his No. 4 Chevrolet was in flames when he stopped in the pits, but Harvick emerged from the cockpit unscathed as the latest of several contenders whose shots at winning went up in smoke. Harvick took the lead from Matt Kenseth in the pits during a caution with 104 laps remaining. Kenseth slipped from first to third because his team had trouble changing tires because of damage to his car from an earlier crash. Kenseth, who led a race-high 164 laps, struggled after the restart with 97 laps remaining. He slid into the outside wall and out of the top 10 but managed to avoid bringing out a yellow. It was one of many strange developments in a race full of major plot twists after inclement weather caused delays of more than four hours. A NASCAR season designed to put an emphasis on winning remained a loser against Mother Nature as rain again registered a major impact at Bristol, the second of four Sprint Cup races this year to suffer weather delays of several hours. The race started more than 90 minutes after its scheduled green flag of 1:13 p.m., and 124 laps were completed before it was stopped at 2:48 p.m.
After a delay of three hours and 19 minutes, the race was restarted under the lights with Kenseth in the lead on the 0.533-mile oval. The race went green on lap 137, and Kurt Busch seized the lead 16 laps later from Kenseth, whose fortunes seemingly took a serious turn for the worse when Cole Whitt spun to trigger a caution flag on lap 157. As Kenseth slowed to avoid the accident, he was drilled by rookie Timmy Hill, and the collision virtually destroyed the rear bumper of Kenseth’s No. 20 Toyota. After two stops under yellow to repair the damage, Kenseth restarted in 29th as the second-to-last car on the lead lap. He caught a break 22 laps later with a caution mandated by NASCAR because of the inclement weather. Kenseth didn’t pit and catapulted to 16th. By the lap 250 halfway mark, he had moved into the top five, and he moved into first with just more than 200 laps remaining — shortly after Joe Gibbs Racing teammate Kyle Busch pitted with a tire problem as one of several leaders who suffered misfortune. There were problems for two early leaders in the race. Jimmie Johnson moved into first with a two-tire stop during a competition caution on Lap 50, but the Hendrick Motorsports driver’s day went sour shortly after yielding the point to Kenseth on Lap 98. The tread of the right-front tire on his No. 48 Chevrolet came unwound, necessitating a green-flag pit stop that dropped him two laps off the pace. Goodyear engineer Rick Heinrich disputed Johnson’s assessment, saying it was attributable to high wear from the two-tire stop and adding the tire was designed to detach by unwinding. Joey Logano also faced adversity early in the race after losing power steering in his No. 22 Ford, which made handling a chore on the high-banked half-mile oval. After starting fourth and leading 12 laps, he lost a lap but managed to stay in the top 30 by the lap 125 rain delay. The Bristol stoppage was half as long as a rain delay of more than six hours that marred the season-opening Daytona 500. Dale Earnhardt Jr. scored his second victory in NASCAR’s crown jewel at 11:18 p.m.
1. (12) Carl Edwards, Ford, 503 laps, 119.2 rating, 47 points, $234,225. 2. (21) Ricky Stenhouse Jr., Ford, 503, 98.9, 42, $166,400. 3. (23) Aric Almirola, Ford, 503, 101.9, 41, $160,161. 4. (37) Tony Stewart, Chevrolet, 503, 87.1, 40, $148,083. 5. (5) Marcos Ambrose, Ford, 503, 89, 39, $131,145. 6. (1) Denny Hamlin, Toyota, 503, 97.8, 39, $116,865. 7. (6) Jeff Gordon, Chevrolet, 503, 88.6, 37, $143,051. 8. (10) Kasey Kahne, Chevrolet, 503, 106.3, 37, $114,965. 9. (38) Brian Vickers, Toyota, 503, 83.3, 35, $131,440. 10. (20) Kyle Larson, Chevrolet, 503, 104.5, 34, $128,160. 11. (26) Austin Dillon, Chevrolet, 503, 67.4, 33, $143,176. 12. (8) Greg Biffle, Ford, 503, 74, 32, $139,240. 13. (3) Matt Kenseth, Toyota, 503, 120.4, 33, $153,826. 14. (2) Brad Keselowski, Ford, 503, 104, 31, $139,398. 15. (15) Clint Bowyer, Toyota, 503, 67.5, 30, $133,531. 16. (9) Ryan Newman, Chevrolet, 503, 76.6, 28, $104,865. 17. (30) Justin Allgaier, Chevrolet, 502, 62.7, 27, $123,273. 18. (36) Danica Patrick, Chevrolet, 502, 55.6, 26, $104,340. 19. (11) Jimmie Johnson, Chevrolet, 501, 87.4, 26, $146,551. 20. (4) Joey Logano, Ford, 500, 92.3, 25, $138,231. 21. (28) Paul Menard, Chevrolet, 500, 66.9, 23, $123,629. 22. (16) David Gilliland, Ford, 500, 65.6, 22, $119,598. 23. (32) Josh Wise, Chevrolet, 499, 48.4, 21, $91,865. 24. (14) Dale Earnhardt Jr., Chevrolet, 499, 74.8, 20, $102,990. 25. (22) A J Allmendinger, Chevrolet, 498, 62.2, 19, $109,448. 26. (34) Michael Annett, Chevrolet, 497, 44.3, 18, $106,123. 27. (25) Casey Mears, Chevrolet, 497, 53.6, 17, $111,762. 28. (35) Reed Sorenson, Chevrolet, 497, 44.9, 16, $94,065. 29. (7) Kyle Busch, Toyota, 496, 99.7, 16, $138,806. 30. (31) Landon Cassill, Chevrolet, 496, 34.5, 0, $92,115. 31. (19) David Ragan, Ford, 495, 43.6, 13, $100,315. 32. (33) Alex Bowman, Toyota, 493, 41.4, 12, $89,740. 33. (39) Travis Kvapil, Ford, 491, 35.2, 11, $89,690. 34. (41) Parker Kligerman, Toyota, 487, 31.8, 10, $89,640. 35. (13) Kurt Busch, Chevrolet, 473, 68.8, 10, $89,590. 36. (29) Martin Truex Jr., Chevrolet, 471, 52.2, 8, $117,448. 37. (24) Michael McDowell, Ford, 469, 40.8, 7, $89,479. 38. (17) Jamie McMurray, Chevrolet, accident, 453, 84.5, 7, $121,894. 39. (27) Kevin Harvick, Chevrolet, accident, 450, 99.2, 6, $121,713. 40. (18) Cole Whitt, Toyota, 430, 39, 4, $76,680. 41. (42) Joe Nemechek, Toyota, rear gear, 322, 27.6, 0, $80,680. 42. (40) Ryan Truex, Toyota, accident, 271, 30.4, 2, $68,680. 43. (43) Timmy Hill, Chevrolet, accident, 160, 23.9, 1, $65,180. Time of Race: 3 hours, 11 minutes, 23 seconds. Lap Leaders: D.Hamlin 1; B.Keselowski 2-41; J.Logano 42-53; J.Johnson 54-97; M.Kenseth 98-119; Ku.Busch 120; M.Kenseth 121-152; Ku.Busch 153-178; J.McMurray 179-188; Ku.Busch 189; C.Bowyer 190-194; Ky.Busch 195-267; K.Kahne 268-277; D.Hamlin 278; K.Kahne 279-284; M.Kenseth 285-333; D.Hamlin 334; M.Kenseth 335-396; D.Hamlin 397; K.Harvick 398-425; C.Edwards 426-503. Leaders Summary (Driver, Times Led, Laps Led): M.Kenseth, 4 times for 165 laps; C.Edwards, 1 time for 78 laps; Ky.Busch, 1 time for 73 laps; J.Johnson, 1 time for 44 laps; B.Keselowski, 1 time for 40 laps; Ku.Busch, 3 times for 28 laps; K.Harvick, 1 time for 28 laps; K.Kahne, 2 times for 16 laps; J.Logano, 1 time for 12 laps; J.McMurray, 1 time for 10 laps; C.Bowyer, 1 time for 5 laps; D.Hamlin, 4 times for 4 laps. Wins: D.Earnhardt Jr., 1; C.Edwards, 1; K.Harvick, 1; Bra.Keselowski, 1. Sprint Cup Series points: 1. Bra.Keselowski, 163; 2. D.Earnhardt Jr., 153; 3. C.Edwards, 152; 4. J.Gordon, 152; 5. J.Johnson, 143; 6. J.Logano, 141; 7. D.Hamlin, 140; 8. M.Kenseth, 138; 9. R.Newman, 125; 10. R.Stenhouse Jr., 122; 11. K.Kahne, 120; 12. G.Biffle, 118. You are currently reading Carl Edwards wins wild, rain-delayed race at Bristol at ARE YOU NEXT.